22 years since its first manga issue was released, One Piece is still going strong and showing little chance of ending anytime soon. Few serialisations reach anywhere near the length One Piece has and with it has come a wealth of other media. 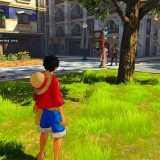 Obviously, being a site focused on video games that’s where our attention turns, with the recent release of One Piece: World Seeker, an open world action adventure game touted as the most ambitious One Piece game ever. While the game certainly is ambitious in scope for the franchise, it falls well short of the standard set by many other games in the genre. 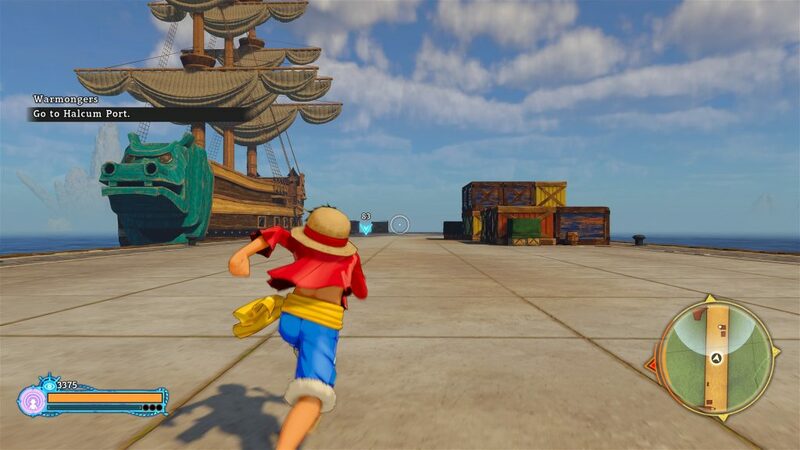 If you’re at all familiar with the One Piece anime or manga, you’ll immediately feel at home in World Seeker’s Prison Island. Created for the game, the island uses architecture and NPC designs that are immediately recognisable to fans of the franchise. Your favourite characters are along for the ride, with Luffy and crew faithfully rendered in a high-quality version of anime realness, avoiding the uncanny valley weirdness of the recent Jump Force. Beyond this however, the quality of the game’s visuals and design drops. There is little variety in the architecture and other props, repeating the same static buildings, trees, plants and rocks over and over. The texture work is over a relatively good quality though, which does help offset the frustration at the sameness of everything. However, the music, especially in towns and cities, is fantastic with a score that’s very reminiscent of the anime and Gravity Rush. These somewhat barren fields and flat lifeless areas lay bare another big issue with World Seeker’s design, the monumentally slow and limited traversal. While the trailers showed off Luffy zipping around off trees, they weren’t representative of the final product. Your running speed in-game is glacial compared to the territory you cover, meaning that using your rubber arms to slingshot off attach points is the only way to move at any decent pace. The issue with this, is that you can’t attach to rock ledges or hills, meaning that unless there are trees or buildings handy, you’re stuck moving at a snail’s pace. Even when you are in the air – which is a skill you have to unlock, by the way – you’ll often have nearby enemies shooting you out of the sky, even if they haven’t actually seen you or are on the other side of walls. 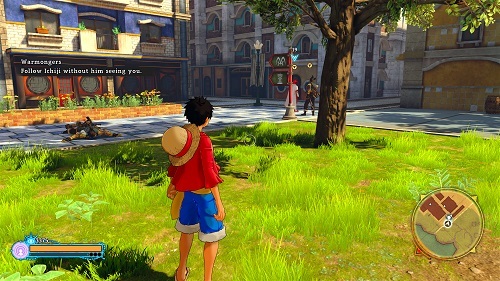 What that means is that no matter where you are in the world, One Piece: World Seeker finds a way to make moving a hassle. Beyond the world itself, One Piece: World Seeker is a poster child for inconsistency and mediocrity. While some cutscenes and story sequences are fully voiced, others are simple text with odd grunt or utterance from those involved. The main characters are lovingly rendered, but the island’s other inhabitants are the same models repeated, with some minor changes to outfits and colours. The game is filled with side quests, but they’re almost entirely fetch quests or simple combat encounters. You permanently have a quest marker on-screen, similar to an MMO, that takes up a massive chunk of the screen and draws your attention away from other visuals. The early game is so easy that you may as well not be looking at the screen while in combat, but the later game story missions are so significantly more difficult that I felt the need to check if I had changed my difficulty settings without realising. The combat is largely one-note, with clunky and floaty controls that make fighting the hoards of enemies a chore, and a combo system that largely consists of mashing the same button over and over. The poor combat is the most frustrating piece of this, as World Seeker’s story pulling in characters from across the series to combat in what would otherwise be interesting boss battles. Prison Island is the single source of an uber-powerful resource called the Dyna Stones and after an attempted pirate invasion wiped out the island’s leadership the Navy came in to take control and restore peace. The island’s inhabitants have split into pro- and anti-navy factions as wealth inequality has started to spread across the island. What results is a populace at boiling pot, as the new leader of island looks to restore peace, enlisting the help of Luffy and the rest of the Strawhat Pirates. Because of the enormous power of the Dyna Stones, many of the most powerful players in the world of One Piece are drawn to the island, often resulting in clashes with Luffy. These boss battles are often the most interesting parts of World Seeker, with each boss having unique abilities you need to learn how to overcome. No two battles are the same, with bombastic visual effects and differing styles of enemy combat creating unique experiences. If it wasn’t for the clunky controls and otherwise poor combat design, I would love a game made purely of World Seeker’s boss encounters. 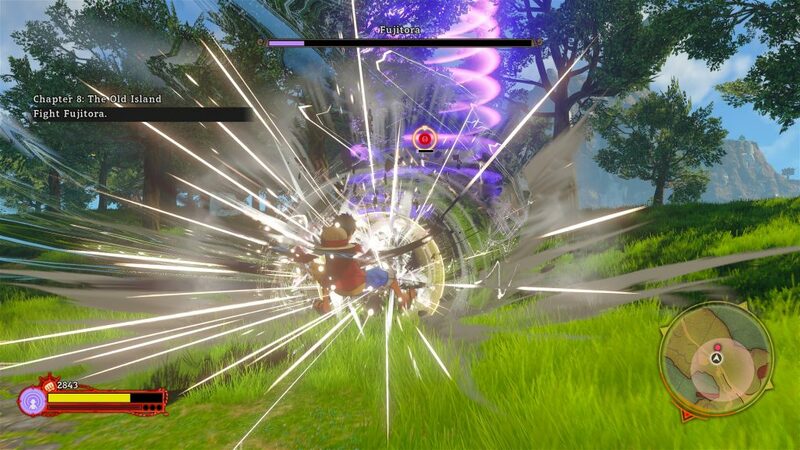 There’s no doubt that One Piece: World Seeker is an ambitious template for the franchise, but it’s also one that is not clearly realised. The game has its moments but is a largely mediocre and frustrating experience that detracts from its more positive aspects. Hopefully Bandai Namco stick to this template for future One Piece games, because there’s certainly promising glimpses of what could be, even if this current iteration falls short.